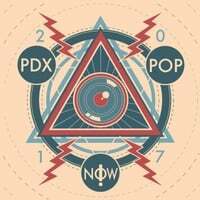 2017 Festival Graphic Artist – PDX POP NOW! Manu Berelli is a graphic designer, printer, and musician based out of Portland, OR. Manu taught himself to screen print t-shirts over a decade ago where he dreamed of becoming a “real” printer of paper art. Manu has been casually archiving images from Golden Age comic books that have fallen into the public domain for the past 7 years. His recent work involves using these source images to create collages of pictures and text for personal commentary.